The Kentucky Derby has been run for almost a century and a half and during that time there have been a lot of fast horses to race at Churchill Downs. With the 144th Kentucky Derby just around the corner we decided to take a look at some of the fastest times in Kentucky Derby history. If you want to know how to pick a winner in this Kentucky Derby then it’s important to do your research of past winners. Decidedly was the 1962 Kentucky Derby winner and has one of the fastest Kentucky Derby times in history, winning the race in 2:00.40. The colt, which was sired by 1954 Derby winner Determine, went on to race until he was five-years-old, winning 11 races, placing in nine, and showing in four. Spend a Buck easily won the Derby in 1985, finishing the race in 2:00 1/5. He was expected to compete in the remaining two legs of the Triple Crown, but his owner decided to skip the Preakness and Belmont Stakes so he could participate in the Jersey Derby. He went on to win the Horse of the Year and Champion 3-year-old Colt in 1985. Northern Dance had the third fastest Derby finish at two minutes flat. He also went on to win the Preakness Stakes that year, but failed to win the Triple Crown after finishing third in the Belmont Stakes. He would retire shortly after the Belmont and die in 1990 at 29. One of the biggest Kentucky Derby surprise winners also had one of the best times in the race’s history. Monarchos rallied from 13th position to win the race in less than two minutes, finishing with an official time of 1:59.97. He was unable to complete the Triple Crown because he wasn’t entered in the Preakness Stakes, and finished third in the Belmont Stakes. If you watch movies then you have probably heard of this horse. Secretariat is considered the greatest thoroughbred thanks to the3 way he dominated his competition during his Triple Crown campaign. 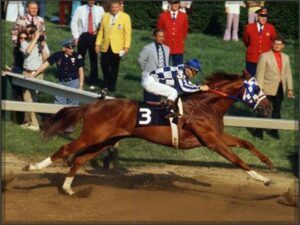 Secretariat still holds the fastest time at the Kentucky Derby at 1:59 2/5, and the record is expected to stand for a while as no other horse has come close to threatening it in 45 years.